Explore the La Jolla Caves by land or sea. Kayak and Visit the La Jolla Sea Caves in San Diego, California. The seven Sea Cavesare in a 75 million year old sandstone sea cliff. The caves are named The Clam's Cave, Sunny Jim Cave, Arch Cave, Sea Surprise, Shopping Cart, Little Sister, and White Lady. 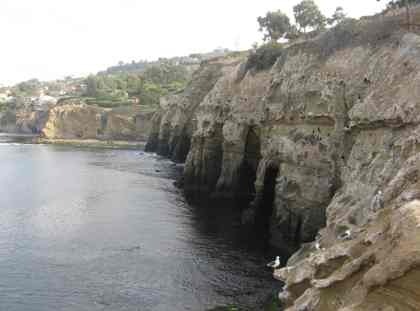 All of the La Jolla Sea Caves are visible from the water. You must be with an approved La Jolla Kayaking tour group to enter the caves. Tours leave from La Jolla Shores beach. Depending on the tide and weather conditions, the tour groups usually enter The Clam's Cave, the largest cave on the western end, and sometimes Arch cave. 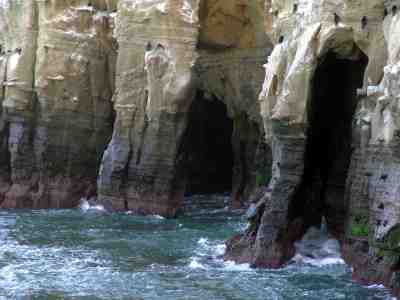 The other caves are visible from the ocean, but are usually too dangerous to enter. You can easily view The Clam's Cave from Coast Blvd. and the historic Coast Walk Trail. If you walk out the edge of the cliff, you can see the other caves as shown in the photo above. While the view is lovely, the smell is not so lovely on the cliffs, as the birds leave their mess there. It is better to keep your distance or enjoy the view from a kayaking tour. 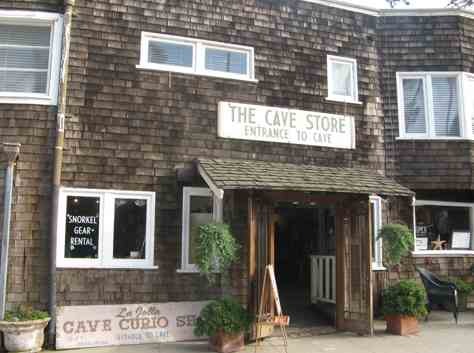 Sunny Jim Cave can be reached from The Cave Store on Coast Blvd. In 1902 a tunnel was dug to the cave. For a small fee you can climb down the 145 steps to the inside of Sunny Jims Cave. The cave tour costs $4 and it is open from 9-5. For information call 858-459-0746. Directions to La Jolla Sea Caves - from Interstate 5 go west on La Jolla Village Drive, left on Torrey Pines Road, right on Prospect Place to 1325 Coast Blvd. South. There is a small parking lot on the right near The Cave Store, or street parking.